Replacing a small AC gear reduction motor? 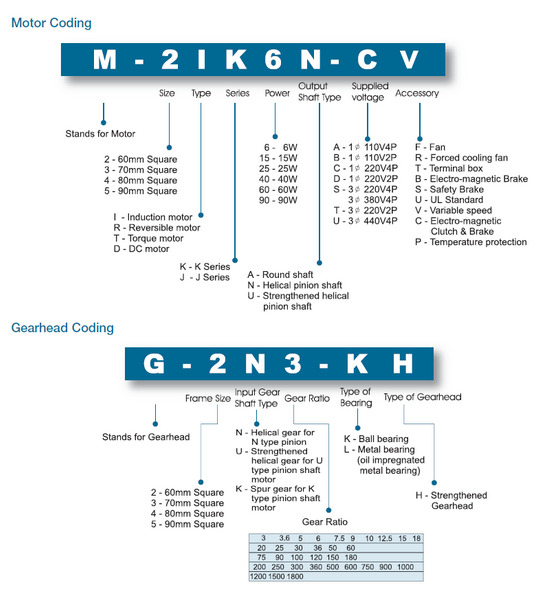 Its quite easy to decipher codes from one brand/manufacturer to another for easy replacement! Just use these manufacturer product codes supplied here! 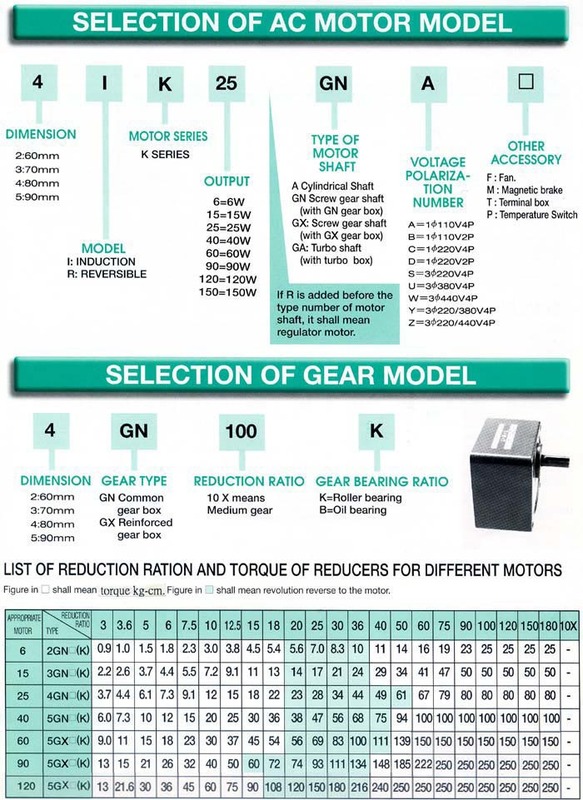 If you know the code of the motor already, you can simply use the search (enter either a full or partial model number) on the website to be taken to the appropriate pages to be shown suitable replacement motors. 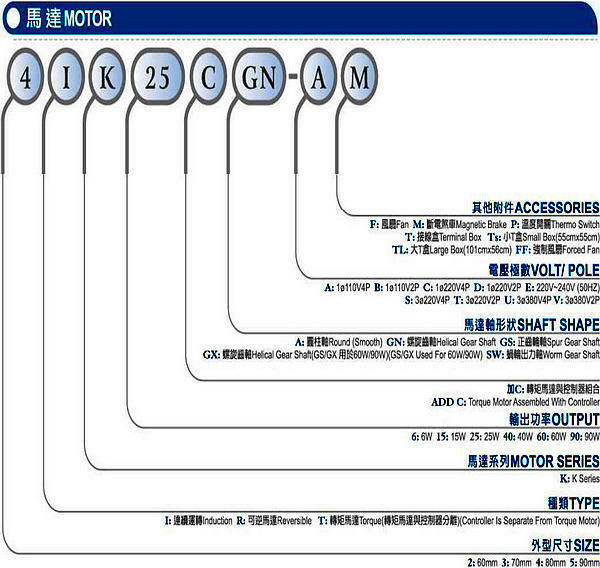 All you have to remember is that EVERY standard motor is a copy of Oriental in one form or another, so they will either use a similar coding system to Oriental or very similar, but they will ALL have the same features, even though their coding system may be very different. 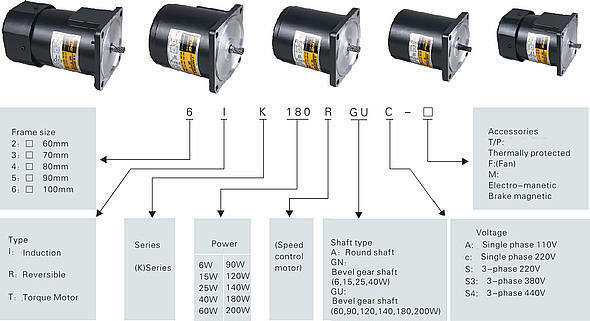 Output on motor or gearbox, can be a geared pinion shaft, keyed shaft, D-Cut or Straight shaft. Straight away, we can see what it is, one because of the label and secondly because we can see the obvious tacho stuck to the rear of the motor. This is nice and new so it's easy to see the label, but the label tends to fall off under certain working environments (especially around food processing plants). Even if it didn't have a label, we know its a 60mm speed control between 6w-15w. Notice the pattern? FRAME, MOTOR TYPE, WATTAGE, GEARBOX, VOLTAGE! Very easy to understand once you know what to look for. 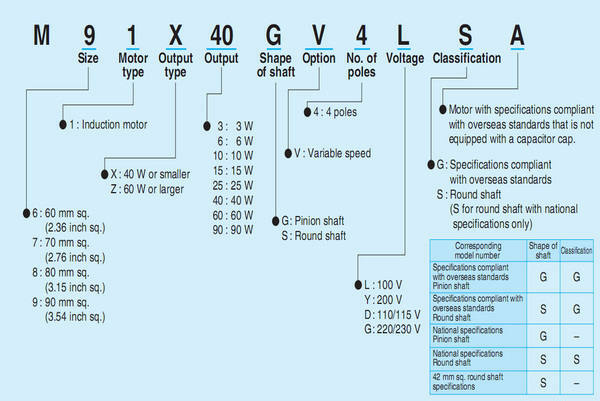 Thinking like this will enable you to read and better understand codes you are not familiar with, while the frame size of the motor, the output shaft size and wiring all give clues to an unmarked motor making them much easier to identify. Heavy or Light impact shafts: The difference? A Light impact shaft means the output shaft of the motor is made of a soft metal. It runs quieter than a heavy impact shaft which has pinion shaft chemically or heat treated to be hardened. The advantage is the transmission noise is greatly reduced, the disadvantage however is that the shaft and gearbox wear at a faster rate and if a shock reverberates back through the gearbox the pinion shaft can be easily damaged. 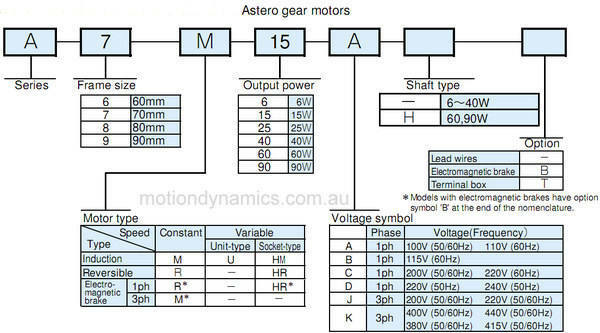 Most motors you will come across are hardened types. The GN/GU (KB/KC in SPG) gearboxes -: GN usually refers to the lightweight gearbox, whereas GU is the heavy duty type gearbox.GU will generally start at 60 Watts and go through to 140w depending on the manufacturer and the type of materials used in the build process. A 90mm GN gearbox is not as strong as a 90mm GU gearbox which offers double the torque capability, from 9Nm to 19Nm. Torque Motor ? This is a motor that generates huge torque at startup and as the speed of the motor increases the torque of the motor gradually drops off. These are used for low speed/high torque requirements or locked rotor starting. They also use a different type of gearbox that is able to withstand much higher radial and thrust loads. Very uncommon and very expensive. The Japanese 'father' of them all. This company invented the original "Standard" motor. Exceptional High Quality though very expensive here in Australia. Still one of the only companies to offer a full waterproof motor in this range. A Korean copy of the Oriental Motor. Overall, a solid product with a good range at a decent price. The Sumitomo Astero (made to Japanese precision standards), is what you would class as the high end version of this motor. Made by SPG (Korea) but to Sumitomos high Japanese precision standards. It is a much higher quality unit than the standard SPG motor. It's not a common product by any means. It's available in Australia from Sumitomo though its not actually stocked here and must be ordered in. Taiwanese copy of the Oriental motor (Even has a similar coding system!). Good quality and a super strong range. Used to be quite a few of these around though rare now because of the expensive price tag. Japanese Oriental copy. Good Quality. Rare outside of Japan. Only seen in Australia nowadays on specialised Panasonic equipment. Taiwanese copy of the Oriental motor (Even has a similar coding system!). Good quality and a good range. 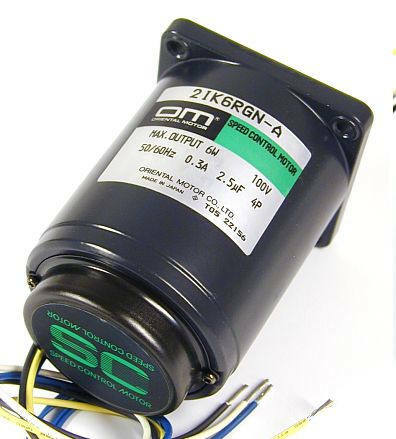 Extremely high quality motors with the most extensive range you can currently buy. Not as cheap as others here, but when you buy a Bison motor you know you get what you pay for. Extremely well built with exceptional precision. Like all Taiwanese products, it's expensive. As you can see, most of the coding systems are very similar to Oriental, except for Panasonic, SPG and Astero. 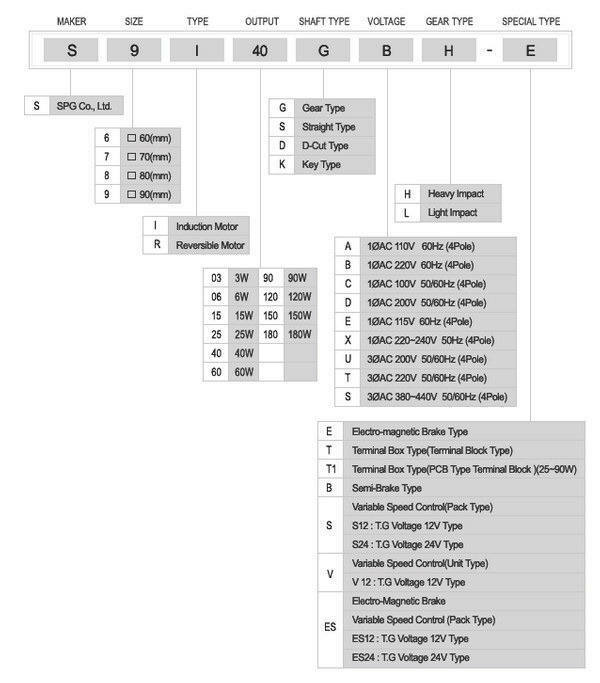 By using these charts (which all follow the same system) you'll find it easy to decipher random codes that manufacturers tend to use.